With the conspicuous nature of the total eclipse phenomena and their strong dependence on geographical location, scientifically useful observations can be made with relatively modest equipment. 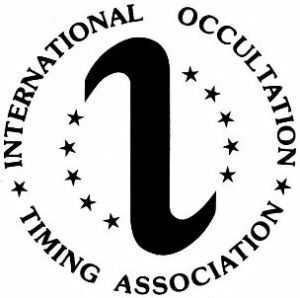 The International Occultation Timing Association (IOTA) is organizing observations of the 2017 eclipse from locations near the edges of the path of totality, to see how well it can be defined. Several efforts have been made at past eclipses to station observers at intervals across the predicted edges of the path of totality. All of these efforts were visual, as described at http://www.eclipsetours.com/eclipse-edge-2017/. IOTA encourages citizen science efforts to determine the location of the edge of totality along the path as it traverses the country. Unlike past eclipses, now we can better document the phenomena using the video function of ubiquitous smart phone cameras. This observation Web page describes how useful smart phone observations can be made. We seek such observations from locations within a kilometer-wide (0.6 mile-wide) “graze zone” along the northern and southern limits of the path of totality. Most of the past efforts assumed that the start and end of totality were instantaneous, that one either had at least a short duration of totality, or none. But the Sun, being a gaseous sphere, does not have a sharp edge, unlike the solid body of the Moon. So although the start and end of totality are quick, they are in fact gradual, especially within the graze zone. This is what we want to study using smart phone videos obtained from many locations across the graze zone. They don’t need to be made from one city or area; they can be made anywhere within the graze zone from coast to coast. The observations can be made by individual observers working alone (or better, in pairs, as described on the observation Web page) or in organized groups, like the past efforts, or like the effort being organized in Minden, Nebraska discussed at http://www.eclipsetours.com/eclipse-edge-2017/. Perhaps other group efforts, organized by schools, libraries, or other local organizations, can bracket the graze zone with multiple observers in cities crossed by the northern and southern limits, such as St. Louis and Kansas City; A list of cities and towns that are especially well-positioned is given at the end of the eclipsetours.com Web page. be made available when it is ready. In its place, view the YouTube video. Recordings of Baily’s beads, especially of the disappearance of the last bead that defines the start of totality, and the reappearance of the first one that ends totality, made near the northern and southern limits of the path of totality (i.e., the graze zones), are useful in determining the diameter of the Sun relative to the Moon at the time of the eclipse. Now that we have precise and comprehensive lunar profile data from NASA’s Lunar Reconnaissance Orbiter, timed recordings of Baily’s Beads made anywhere within the path of totality, including near the center, are useful for this project. But the beading phenomena are richer and more prolonged near the limits, just as lunar grazing occultations of distant stars with their multiple contacts (a good example of a grazing occultation is shown in this video are more interesting to observe than the single events normally seen during total lunar occultations. Important: The intensity of the part of the Sun that remains visible at central eclipse will change considerably across the graze zone; that’s what we want to measure! North of the north edge of the northern-limit graze zone (or south of the south edge of the southern one), the remaining piece of the Sun will be very bright, and it is recommended that observers there use eclipse glasses the whole time. Those in the graze zone, and farther south, should look for the splendor of totality during the minute surrounding the central time for your location, but use the eclipse glasses when the Sun is too bright to comfortably look at without them. Dunham (dunham@starpower.net) has a supply of safe eclipse glasses to supply teams of observers in the graze zone; contact him if your team could use them. More on viewing the eclipse safely is at https://eclipse.aas.org/eye-safety/safe-viewing . Other Observations: Besides lines of observers with cell phones bracketing the “graze zone” at the limits, we want observations made with various past-used techniques, to determine their consistency. 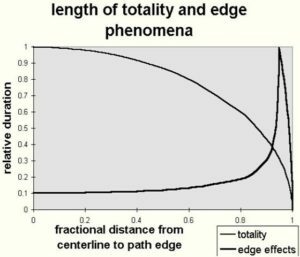 The goals are to help determine the accuracy to which the edge of the path of totality can be defined, and to contribute to a long-term study to measure changes in the size of the Sun, and the accuracy to which that can be done. David Dunham will be bringing 3 or 4 extra small telescopes and video systems that he hopes some observers in the graze zone, in the area where he observes, can operate; he hopes to train the local observers in their use the afternoon (Sun. Aug. 20) before the eclipse. Dunham’s planned location is Moberly, Missouri, but he will travel to other (probably) northern-limit locations if the weather forecast is unfavorable for north-central Missouri. Information about these small systems, which can record Baily’s beads in more detail than smart phones, is here . With many dozens of Baily’s beads visible over a period of a few minutes, an eclipse observed near the path edges is the ultimate lunar “grazing occultation”. 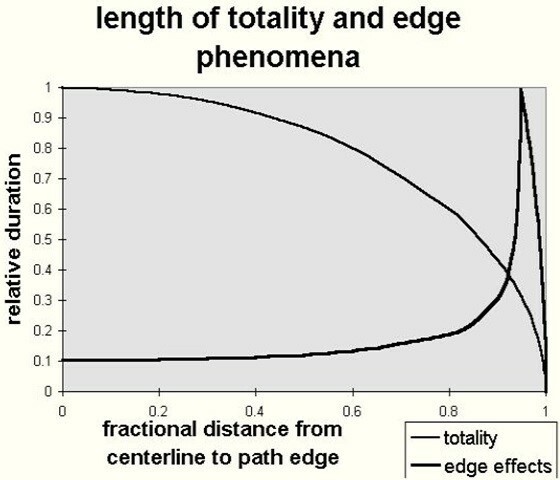 As shown in the diagram, edge phenomena of interest for this experiment, the Baily’s beads and chromosphere, are enhanced by a factor of about 10 for locations a short distance inside the path edges while the duration of totality is still a quarter to a third of that at the center. Few amateur astronomers will be observing from the graze zone since most of them will travel deeper into the path of totality. If you live in or near the graze zone, and are content to observe there, you are encouraged to contribute to our experiment by recording the eclipse with a smart phone. But if you have a small telescope, and/or a DSLR camera, you can make observations of even more value. You can just hold your smart phone, to point its camera lens into a low-power eyepiece, although it may be a little difficult to line the two up to keep recording a good image. There are devices to attach smart phones to telescopes; one source for them is www.phoneskope.com. Information about these more sophisticated observations are given at https://eclipsemega.movie/megamovie (one of their goals is to obtain images of Baily’s beads and the diamond ring), some at IOTA’s site at http://eclipsetours.com/eclipse-edge-2017/ , and at general sites such as http://www.eclipse2017.org/2017/photographing.HTM (but note that in the graze zone, the best images will be of Baily’s beads and the diamond ring, NOT of the corona). Where are the eclipse “graze zones”? Observations of recent eclipses indicate that the solar diameter is a little larger than the standard value used for predictions, so IOTA defines the eclipse “graze zone” as extending from 300 meters (~1000 feet) outside the predicted limit to 700 meters (~2000 feet) inside the limit. Maps of the graze zone, along the northern limit, are plotted across the St Louis area , across SW Iowa, and across northern Moberly, MO, across Bowling Green KY, across Oak Ridge TN, and along the southern limit across the Kansas City area . Ideally, we would like to have observers at 50-meter (~175-feet) intervals across the eclipse graze zone, but as noted before, they don’t need to be along one road, or in one north-south line; they can be spread east and west within the graze zone. Note that the graze zone shifts about 500 ft. south (measured perpendicular to the limit line) for each 1000 ft. of elevation above sea level. Instructions on how to plot the graze zone in your area are here. 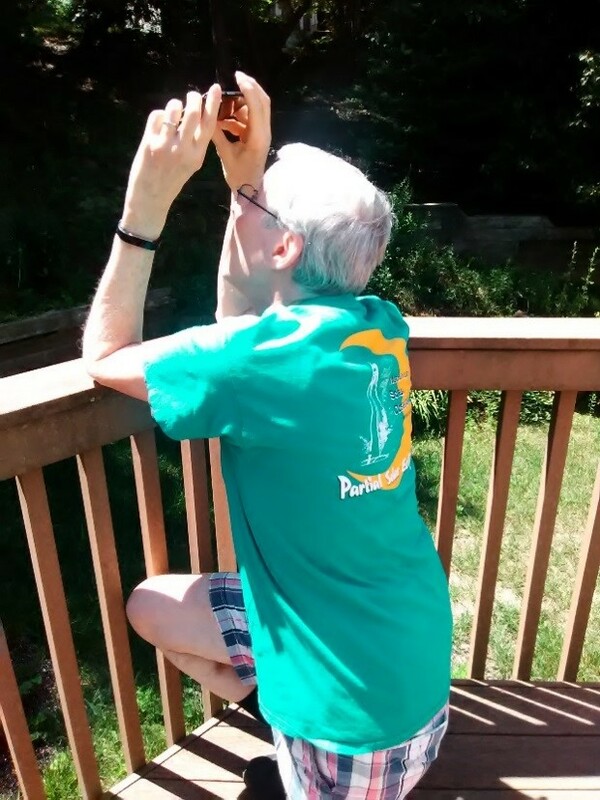 Coordinating the graze zone observations: If you can make smart phone or other observations from the eclipse graze zone near either the northern or southern limit of the path of totality, please let IOTA know; we want to coordinate the overall effort, and distribute safe eclipse glasses to where they might be most needed. Some mobile IOTA observers may change their observing location, based on the weather forecast a day or two before the eclipse, so one or two of them might decide to travel to your area, where they could assist you (or you might help them) in making observations. Please send an email message to David Dunham at IOTA at dunham@starpower.net giving your name; the latitude and longitude (coordinates to the nearest arc second can be obtained using Google Earth; alternately, you can give the street address) of your intended observing site (or specify the segment of a road, between two intersecting roads, if you will be part of a group observing from more than one location); your cell phone number; the number of possible observers in your area, if more than just you; the name of your organization (if two or more members of the organization will be attempting observation); and how you plan to observe the eclipse [with smart phone, with or without a telephoto lens and/or tripod; or with a telescope (specify type); or other]. After the eclipse, we will collect observations, probably via the Eclipse Megamovie Project , especially if there are large numbers of graze zone observations. But we expect to also post a report form that you can email to us, and may have a DropBox or Google Drive address where you can upload your smart phone videos; more about reporting will be posted here before the eclipse. Practice: Whichever way you observe the eclipse, you should make a dry run, to test the full procedure during a day before August 21st, at the same time that the eclipse will occur on August 21st; then it will be in the same general direction in the sky as the eclipse will be. I think it will help if you select a day that is mostly cloudy, so the Sun is fainter shining through the clouds, which can mimic the deep partial phases before totality. The asteroidal occultation handout gives basic information about 3 other “eclipses” (actually occultations) of stars by asteroids that will be visible with small telescopes the morning of August 14 (visible from Tucson to w. Kansas, e. Nebr., and the Minneapolis area; the star is bright enough to see with binoculars; it was very cloudy & no observations were obtained); the evening of August 22 (s. Ariz. to Kansas, n.w. Missouri, Iowa, & Wisconsin); and the morning of August 24 (Sacramento to Denver, s. Nebraska, n. Missouri, & s. Iowa); IOTA will try to observe these events as well, and you are invited to participate (if interested, contact Dunham at dunham@starpower.net ). For more information on observing techniques for Baily’s Beads, see the information in the free IOTA Observer’s Manual (Chapter 11 specifically covers Solar Eclipse observing). Richard Nugent, Houston, TX at rnugent@wt.net or David Dunham, Greenbelt, MD at dunham@starpower.net.